Started in 1994 by the Vancouver Aquarium, The Great Canadian Shoreline Cleanup is a national project aimed at mobilizing the public for a weeklong garbage pick-up along Canada's sprawling shorelines. This week, the call went out for previous participants to register for this year's event. 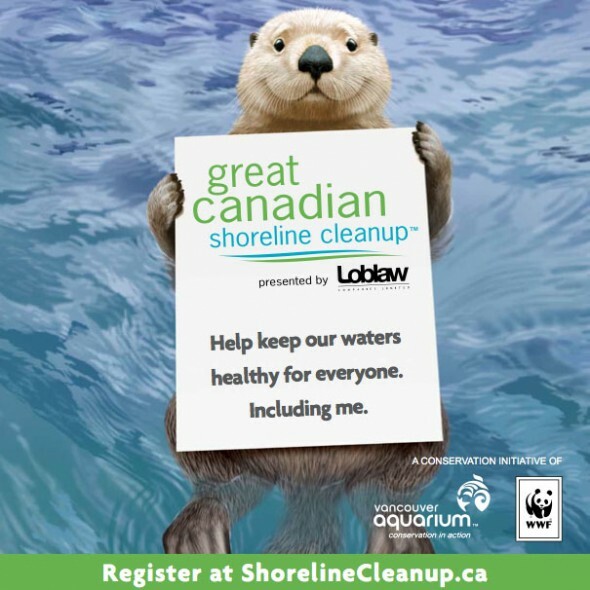 By registering early, companies or single participants can claim sections of local shoreline that they want to be responsible for. The 2012 cleanup is scheduled for the third week in September. Last year, the cleanup netted 147,637 kgs (325,483 lbs) of trash. There were over 50,000 participants working at over 1,600 sites, with a total distance of 3,144 kms (1,954 miles) of shoreline cleaned. Impressive! Participation in this year's event can be done in two ways; volunteers can choose to take on a role as a cleanup participant or lead a group as a site coordinator. Sites are designated on a first come first serve basis. So if you have a patch of shoreline that you would like to focus on, register early. If you are a teacher hoping to incorporate some of the lessons from the Shoreline Cleanup into your units, check out the online resources for elementary school lesson integration. For yearlong cleanup initiatives, try taking responsibility for a section of shoreline and visit it bi-weekly to remove trash. You can also implement gorilla tactics by painting fish symbols above your local storm drains. This reminds the public that all our drains eventually empty into our waterways. Recycling, reusing and respecting the environment are three other ways of helping keep our waterways clean throughout the year. Shore cleanup is a conservation effort that Feathercraft Kayaks is deeply connected with. We want to protect the wildlife and ecosystems that share our shores. Cleanup programs are an excellent way to help. Staggering statistic: last year the Shoreline Cleanup retrieved 351,238 cigarette buts.